CINNAMON MYRTLE, Backhousia myrtifolia can be found in the rainforests of subtropical Australia from Bega on the NSW south coast to Fraser Island off Queensland. 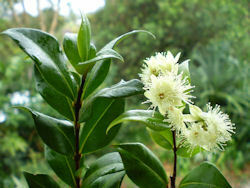 It is a small tree (up to 7 metres), forms a low canopy. The leaves are 3-6 cm long and have a pleasant spicy cinnamon-like aroma and flavour , and can be used as a spice in various dishes. The cream coloured flowers are star shaped followed by star-like capsules. Cinnamon Myrtle is used in savoury recipes, deserts, confectionary and herbal teas. Add to curries, stews and rice dishes (wonderful in steamed rice). Can also be used in biscuits, sweets and slices – anywhere cinnamon is used. Cinnamon Myrtle makes a calming medicinal tea useful for Dyspepsia, heartburn, colic and the digestive system. Mix with lemon myrtle and chilli and add to breadcrumb mix.